Any Time. Any Place. Any Device. Keep Learning! Cost-effective LOL offers flexible bandwidth usage. 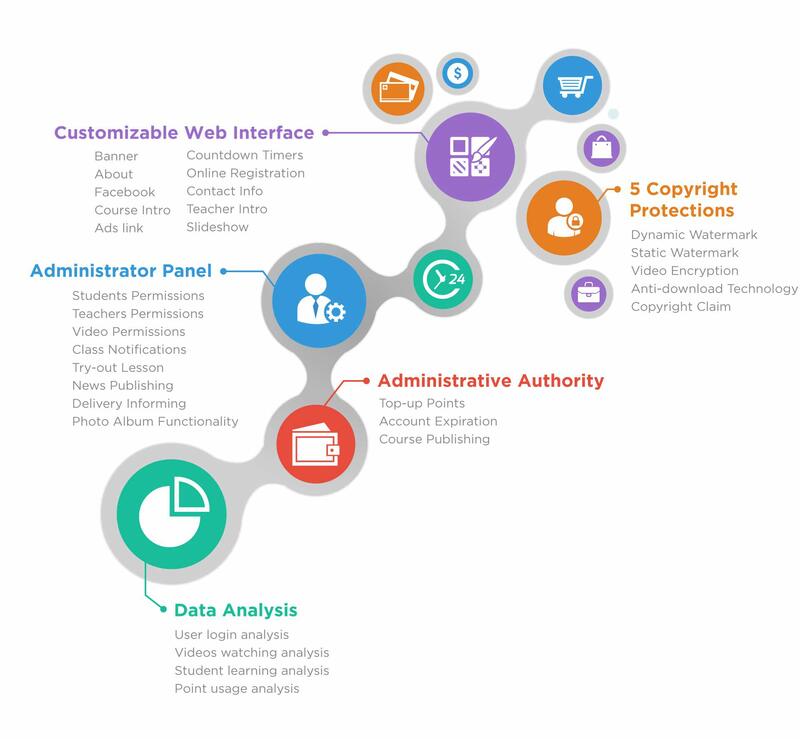 Numerous features such as permissions for teachers and students, trial lessons, news update, package tracking, point system, online registration, and photo album functionality make LOL a powerful choice. Any Time, any place, just keep learning via PC, tablet, or mobile phone. Automatic video conversion to most video formats. High efficiency auto video conversion engine, saves time and effort! Allow multiple classes to share one video file. Control view count with unique point system. No additional fees for adding more information. Flexible course and video publishing functionality. Customizable permissions for teachers and students. High security video RSA encryption. Secure watermark logo added to videos automatically. Publish the latest news to specific user groups. Monitor delivery status with package tracking functionality. Upload pictures or images to create your own photo albums. Customizable web interface designed to let you modify banner, background, image, and text by yourself. Online registration and contact functionality. Set date countdown timers for exams or important dates in order to put in the mind of students. Free advertising via trial packages. Send instant messages, exam results, and important notices via SMS. Save your own preset messages and send unlimited text via imported EXCEL file. Track and record student logins learning progress, and usage statistics. Automatic analytics shows current play status. Compatible with Google Analytics for lots of awesome data. Share LOL contents directly to Facebook and Google+. Advanced dynamic watermark module effectively prevents pirating. Free registration via Facebook or Google+. Payment Module supports credit card, debit card, ATM, and convenience store payment. Set up marketing plans with price and detailed illustration for payment module. For example, your sailing plans could be teaching materials, e-learning course, handout, point, and course…etc. While student observes the plans and wants to buy it instantly, just pay for it via the platform. Quick, easy, and fast! Payment Module supports credit card, debit card, ATM, and convenience store payment. All purchasing records will be saved in order to ensure the rights and interests between education institution and student. To protect the copyright and prevent video piracy, dynamic watermark must be your best choice. We added better protection, improved performance and superior design to create dynamic watermark. To protect the copyright and prevent video piracy, dynamic watermark displays user’s login account randomly on the video. It’s the best video protection of watermark module for your PCs, smartphones and tablets. 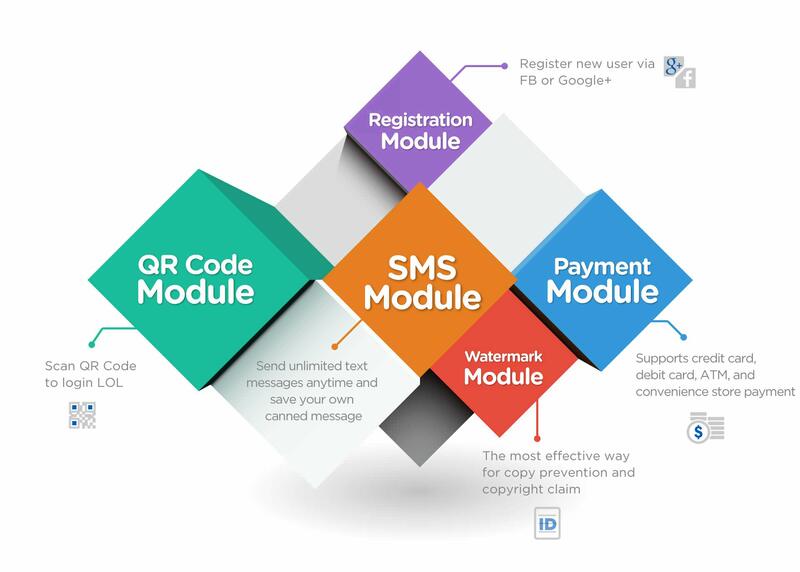 Send text messages directly from SMS Module. It’s quick, simple, cost-effective, and especially great value for texting to lots of people. Just save your own canned message and use it for times free and easy. Checking the delivery status after you send text messages to make sure the information transmitting to the specific person. QR Code is really common nowadays and has various applications. Even vegetables in the supermarket have QR Code for traceability. Every video in LOL has own QR Code for scanning. Total 3 ways for video watching via scanning QR Code, there are public, password, and membership. To fasten register process, registration module must be your best choice. As long as you have Facebook or Google+ account, just login and enroll as new user in one second and you are the formal member. Members can gets free points and belong to class which administrator assigned. Moreover, LOL is good for 24/7/365 advertising and try-out center.